Shot in JPEG without post processing. The frame is unique, which is oversize, compared to regular racquets. Painted on the frame is the word, "Oversize". 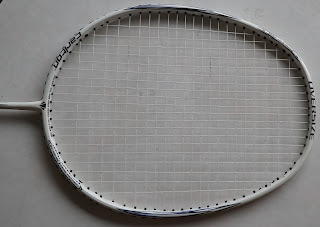 The racquet has unique stringing pattern, with an extra grommet to increase the number of vertical & horizontal strings intersect, therefore increasing the sweetspot. However, the stress point also increases at the place of the extra grommet. My stringer was telling me about this rare stringing pattern. Rather innovative design.